Posted by CCLD in Bookmobile, Community. The deadline for submissions to the Bookmobile cookbook has been extended to April 17, 2015. Please bring us your favorite recipes and we will include them in the cookbook. Be sure to include your name and city so we can give credit. Drop recipes off at the Bookmobile or any CCLD library. Let’s see what delicious reading we can create. It’s that dreaded time of year again. Winter is on its way, but we have a few holidays in the next couple of months to prepare for, to brighten up the gloomy days of November. Whether it’s the first year you are making a Thanksgiving Dinner, or even if you’ve done it for years, whether you are cooking for two or for a crowd, or trying to find that perfect dish to bring to wow the family, we have books to help you get started, books to give you ideas for updating your cooking methods, or books to add something new to the menu. 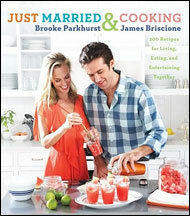 For the first timers, try: Just Married & Cooking : 200 Recipes for Living, Eating, and Entertaining Together, a brand new book by Brooke Parkhurst, or Thanksgiving 101 by Rick Rodgers. 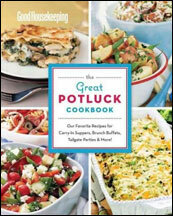 For those bringing a dish to pass, try: The Great Potluck Cookbook: Our Favorite Recipes for Carry-in Suppers, Brunch Buffets, Tailgate Parties & More! , another 2011 book. Anyone will like: The New Best Recipe, by Cook’s Illustrated Editors, or anything by America’s Test Kitchen Editors. And how could I forget the DVD: Martha’s Classic Thanksgiving (by Martha Stewart, of course). We have a display of cookbooks at the top of the stairs on the second floor of Steele Memorial Library. You will find hundreds of cookbooks on every conceivable subject in the Dewey number 641.5 section and those specifically about Thanksgiving in 641.568. However you spend this holiday, have a wonderful day!